Late last year I sowed some corn right up the back of our property behind the shed, figuring it didn’t need much looking after and would do well on the ground where our pigs had been. I mulched it with the old chicken coop bedding straw. It did grow fairly well, especially for the minimal (zero?!) effort I put in. But then last time I checked on it, I found this! I’m pointing the finger at a possum we’ve seen occasionally, but it could just as easily have been rats. I’ve seen a few in the shed lately. Or even cockatoos. 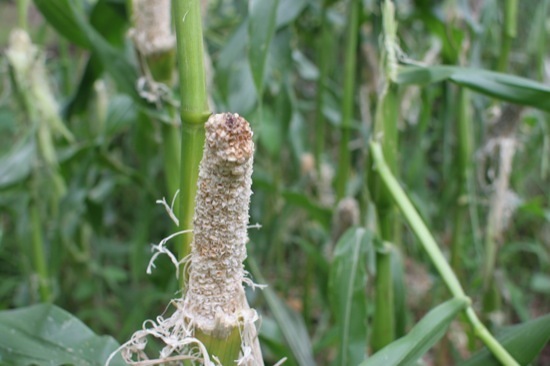 How do you protect your corn from hungry animals? …dogs. 2 of them [not overtly cranky dogs, just 1s with a good, but mostly muted, prey drive]. do the trick? our dogs chase off the possums [so far] + anything else that might try to eat our produce [tho we do have a family of small field mice in one of our compost bins – can’t bring myself to get rid of them tho, even tho i know i should]. on another front, we have a glut of tomatoes right now: any tips on preserving them? bottling/drying etc? would be greatly appreciated! @Mez: We’ve got a dog now (kelpie), but I have to keep her contained at the moment. She keeps running off and chasing the neighbours cows (and, being a not-too-smart puppy, chasing cars!). So unfortunately she wasn’t able to protect the area where the corn was growing. I’m planning to get one of those electronic collar thingies that warn the dog if it gets too close to the boundary wire, and then train her to stay within our yard. Hopefully that helps! ah, fair enuff Darren: that would make things difficult if ur land isn’t completely fenced off. + Kelpies r very smart in terms of their working capabilities, tho training/shaping them can take an enormous amount of time. good luck! @Mez: Our fences are pretty good – barbed wire, with chicken wire attached all around. However, there are a few gaps, and she’s very good at finding them (better than I am at blocking them!). I think the electronic collar will help a lot! 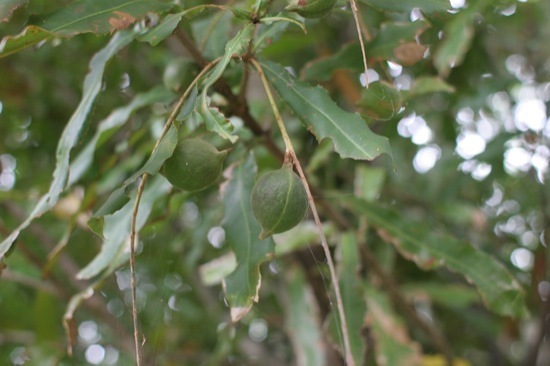 How old is your macadamia tree? We wonder when ours will start bearing? Too bad about the corn. @Kate: This macadamia is about 15 years old, I think. It only started bearing about 3-4 years ago, just before we bought. Modern grafted ones are supposed to bear a lot earlier, though. My main pest is my dog is a constant battle to keep her out of Veg garden she seems to be able to squeeze through any gap. Ive been having trouble with worms in my egg plants and aphids on my kale. Might seem tedious but i daily check for unwanted bugs and pet lizards get a free feed . @Sharon: Yeah, it was pretty disheartening! I’ll give it another go in spring and see what happens. Woah! This is my first year to grow corn so I’m not sure about how to keep them from turning out like this. However we have a very nervous, neurotic dog with a strong bark who keeps just about everything out of the yard, but we do have her within a large fenced in area. @Chris: Good luck! I’ve grown corn many times in the past, and this hasn’t happened before. I hadn’t grown it in this part of the yard before, though – I think I might have been near a possum’s home or something! I’m sure yours will be more successful. Oh no! 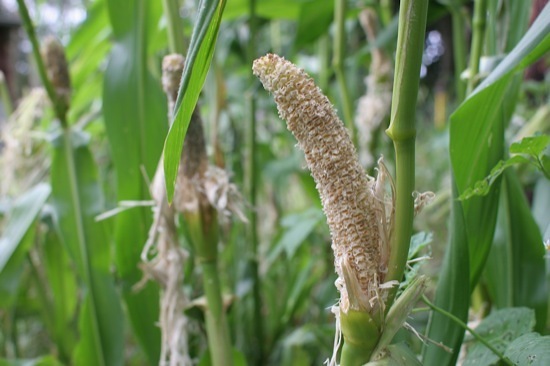 How disheartening 🙁 We don’t grow corn – I’m still wary of the amount of water that it uses. My greens though – the bok choy, lettuce and that type of thing get decimated by slugs. I plant from seedlings (I know, lazy) and they have gorgeous green leaves and then within a day or so I come back to little stumps. Any suggestions? @Alli: It was just a small experimental patch, but still the fresh corn would have been a nice treat. I didn’t water it at all once it got going, as we’ve had a very wet summer here. I’ve found that crushed egg shells and a layer of coffee grounds around seedlings help to keep the slugs and snails away. Beer traps work fairly well for catching them, and the ducks appreciate the snack! Some people also put strips of copper around the seedlings, as slugs won’t cross them (they get a weird electrical sensation, kind of like when aluminium foil touches a tooth filling), but I’ve found that too fiddly.